This painting was created from a photo I took at a local village flower show. The flower show is an annual event and the whole village including the castle/chateau is festooned with flower arrangements. It really is a must to see if you are ever in the French riviera in April. Following on from painting pastels the colourful way, I decided to try the technique on a flower subject and the vibrancy of these parrot tulips just cried out to be painted. Step 1 - I drew the parrot tulips and blocked in with colour, using cold colours for the darks and warm colours for the lights. Overpainting the underpainting to make the colours 'look right'. Definitely a strange looking stage. Dividing the blocks of colour into 3 or 4 areas and finding the light and dark planes. Is a continuation of step 3. Dividing each of the areas created in step 3 again into 3 or 4 and digging deeper to find the changes in plane and colour. Any detail is also added in this last step. just painting parrot tulips...got them for valentines :) found ur blog..great thank you Marion! I am very much impressed with your painting. I like to appreciate your good work. Your Paintings are so awesome. Thanks for this wonderful work. 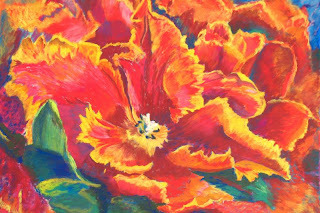 Painting parrot tulips is so awesome. You are a great painter. Best of luck. Thank you all for your comments. It's nice to know that someone likes the painting. I really enjoyed doing this one.